Am I colour blind? Should this card not be yellow? Combined with Sweet Dreams this does a lot for Hastur - annoyingly as a day card such a combo isn't going to really happen so choose one or the other. This one has a longer lasting effect, but I'd say support destruction is more common than event cancel (Red Tape will prove me wrong possibly), and it only hits non uniques, yours included. 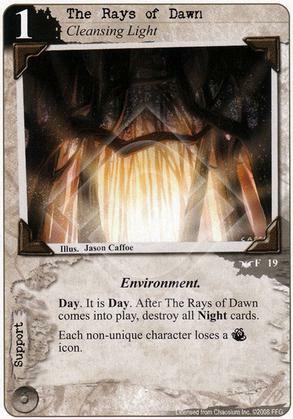 Also it prevents other Night cards, also for Hastur I prefer the event. In other factions I'm less keen. Losing a single icon often means the opponent will still have more terror than you as a human faction, so not that much help there. Cheap day card, sure, but not the only one, and cards like Hermetic Seal are far more flexible in their use. In Mythos you hit your own terror so that's not likely either. Ironically, this card is probably best in a terror-based deck. Unfortunately, it only hits non-unique characters, and usually uniques are the ones with nasty abilities you want to hit hardest with removal effects (including insanity). This is also pretty lackluster as terror defense, since it probably makes all of your dudes vulnerable unless they have willpower. This card is really good. There are plenty of ways to temporarily remove terror icons/struggles but this card does it with a lasting effect. When used in MU icon manipulation (alternative historian, chess prodigy etc.) This card halves the amount of struggles you need to manipulate. In hastur it removes the most common form of immunity to your insanity causing effects. It only effects non uniques but that can be an advantage if you build a unique heavy deck. Not forgetting that one of the strongest hastur decks is lunatics which doesn't have terror icons.